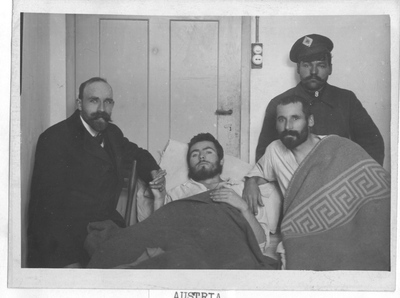 J. J. Hertig, a Danish YMCA secretary, visits two ill Russian prisoners of war in an unidentified Austro-Hungarian prison camp. A Russian corpsman also poses in the picture to the right. WPA Secretaries made every effort to visit and minister to sick and wounded Allied prisoners.